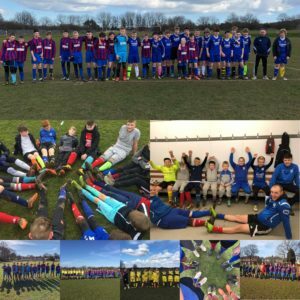 South Park Rangers supported World Autism Awareness Week by asking all teams to wear odd socks during training and games at the weekend. SPR have also recently started a Autism Development Centre specifically for young players with Autism. Over the weekend SPR also had a collection box going around each of the games for the spectators to donate towards the local charity called Daisy Chain. We manage to raise £96.50 for Daisy Chain charity. This may seem like a small amount of money but when you think that this was raised in the space of 3 hours, it is a decent amount. As a club SPR have fully got behind supporting young people with Autism and are wanting to help them get further in football. This could be playing football or coaching football. SPR are always looking for ways to get more people into coaching. SPR jumped at the chance to show there support for young people with autism and to raise the awareness for something that many people dont understand. Autism is something that people think means one thing and that is young people who hit out and who are lazy. This is totally wrong and as the lead of the SPR Autism development centre (Sam Bell) says “Young people with Autism are no different to other young people, they are just more challenging”. What we are trying to say is Autism cant be looked at as a barrier that cant be broken down but more as a challenge that can be achieved. Each young player who comes to SPR whether part of the Autism development or in the main stream development will be treat the same and will be given every chance to achieve success. Below is a montage of images from SPR teams showing there support for Autism #StandoutforAutism. Don’t be down because you feel different be proud because you are unique!